LP and I just came home from a whirlwind trip to Boston for a family event. We had 5 fun and family-packed days. One of the many delights for us was 2 nights in a hotel (oh the pool!) which meant more hangout time with cousins (and for me with my siblings). 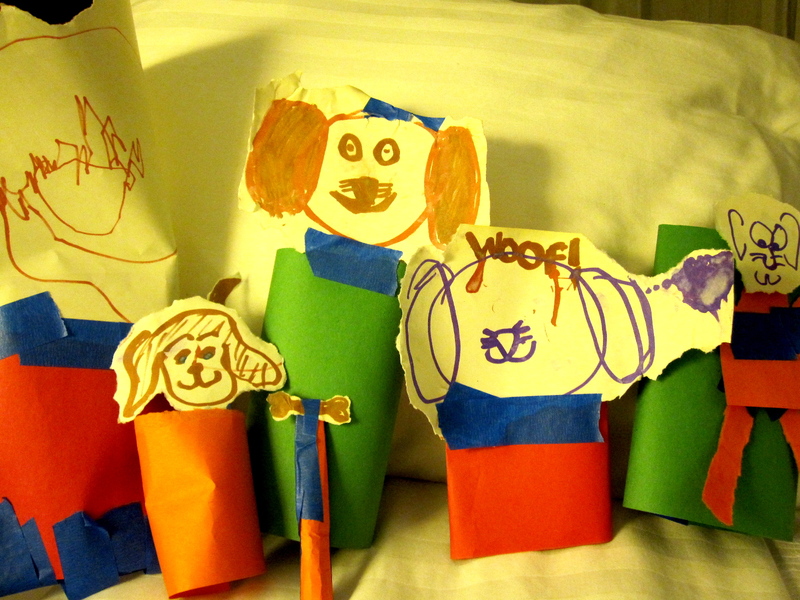 The second night, my 7-year-old niece and LP were at loose ends, so we three girls went to our room to make some puppets. 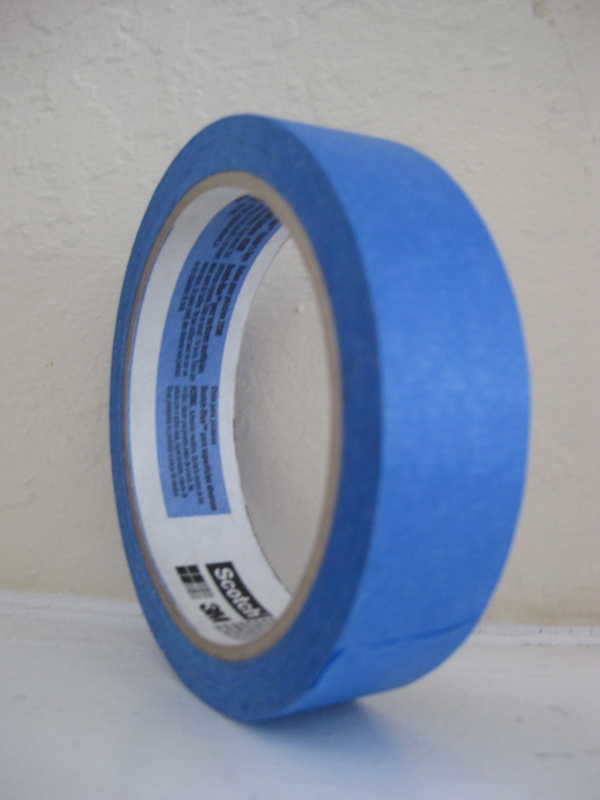 Those of you who have read my blog for awhile know that I don’t leave home without blue painters tape and you can see how useful it was for this make-it-up craft. We took turns drawing faces (mostly dogs, of course) and then carefully ripped them out and taped them onto construction paper tubes (another travel essential). The tubes were various sizes and fit either over a few fingers or a whole hand depending on the size of the puppeteers hands. LP also asked for a bone puppet for the dogs so I made that one for her. 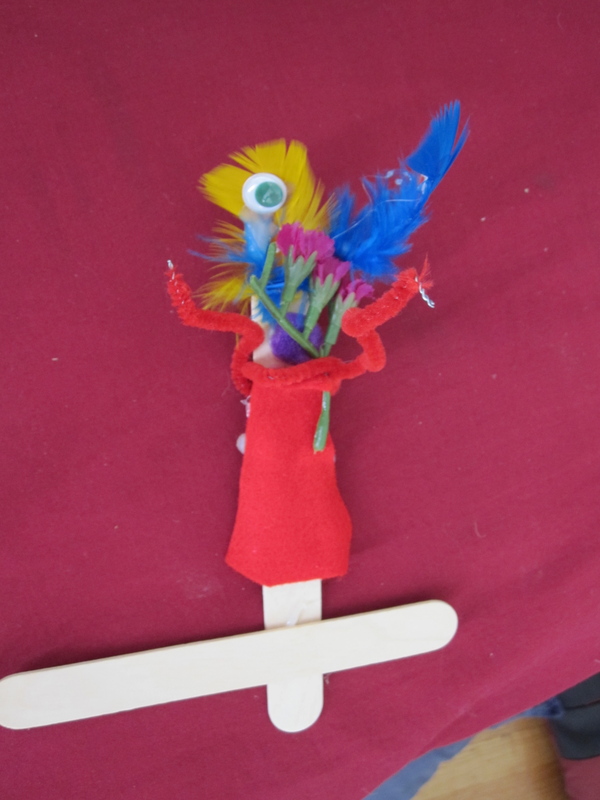 It was fun to have time with my crafty niece and experience her creativity in action (I love that one of her dog puppets “Woof” has his name written on his forehead). Much to LP’s disappointment, there wasn’t time to gather all the cousins together for a puppet show before bedtime. 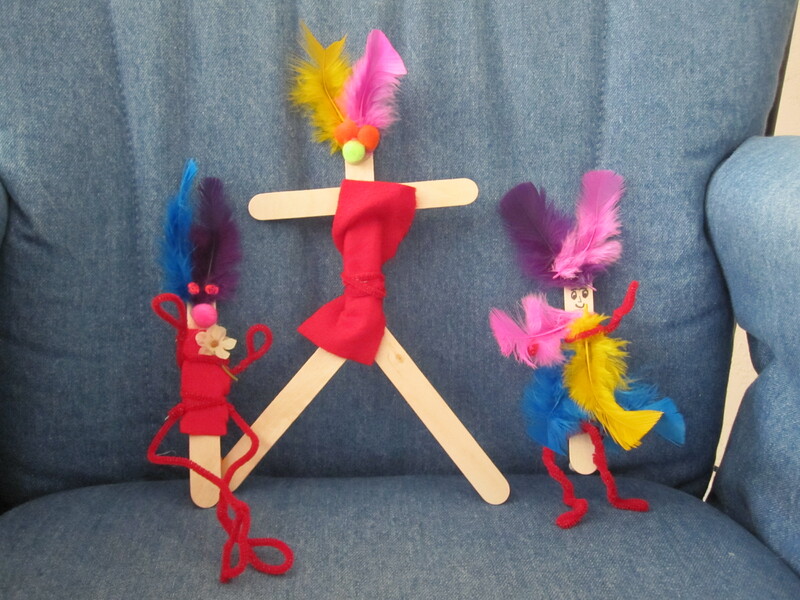 However, the puppets packed up easily for the next leg of our journey and when we were finished playing, they were recycled. 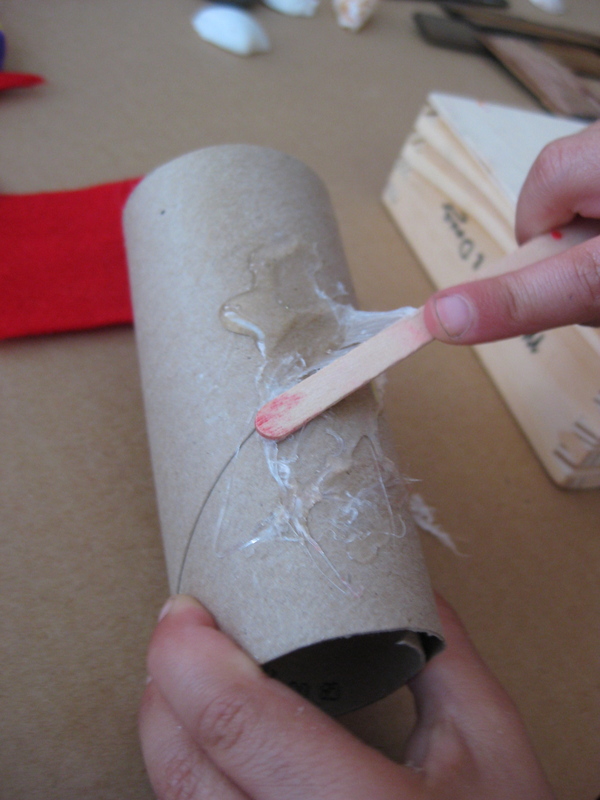 Full credit to Teacher Tom for this… See his blog posts here and here for inspiration and ideas for how to give little people the opportunity to work with hot glue guns. 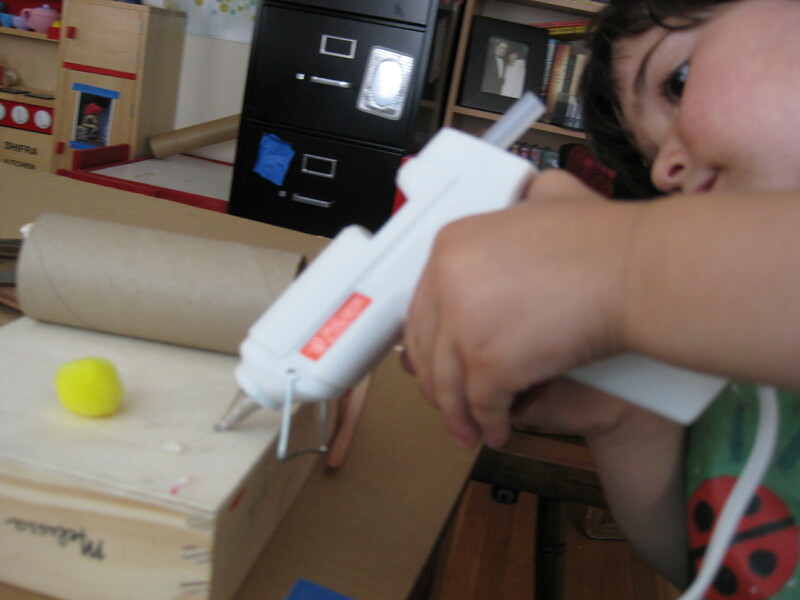 Things went pretty much as he described, she was so intent on her project that when she did touch the too hot glue, she reacted only briefly and got back to work. 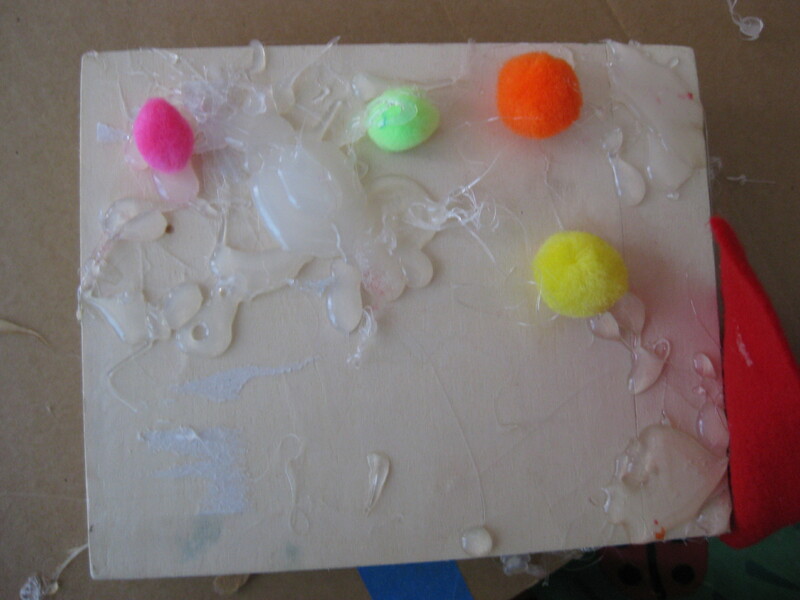 My main supervision ended up being around making sure it was put down safely and adding more glue sticks. One thing that is great for me about a project like this is that it challenges me to control myself and give her space to discover the possibilities. 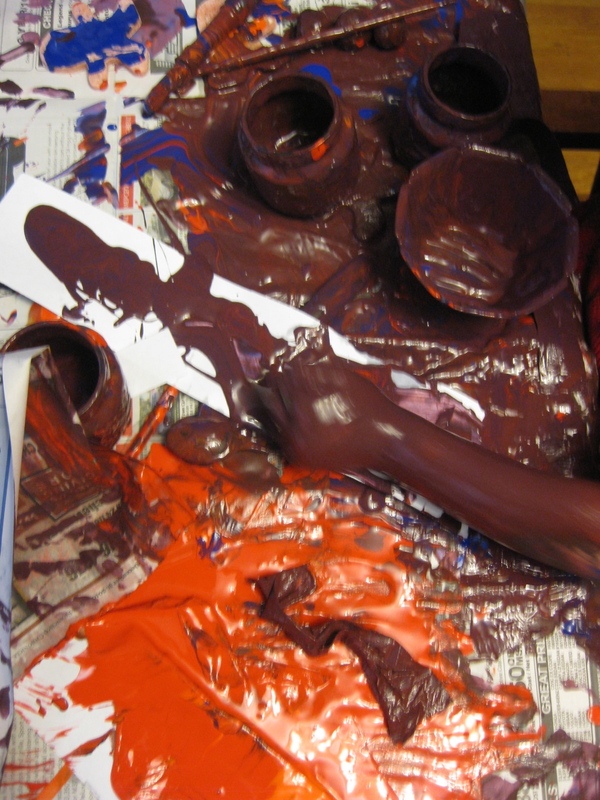 I had visions of building sculptures…LP wanted to build glue piles and dots and squiggles. The important thing in this moment was to say “yes” with my behavior to support her creative exploration and to allow her to use her spontaneity to explore rather than be directive and product oriented. Painters Tape, Oh, Painters Tape! I love blue painters tape. This feeling started slowly…a roll of painter’s tape for an emergency diaper fix, to cover a few electrical outlets and quick hang up some family photos for baby LP to see. 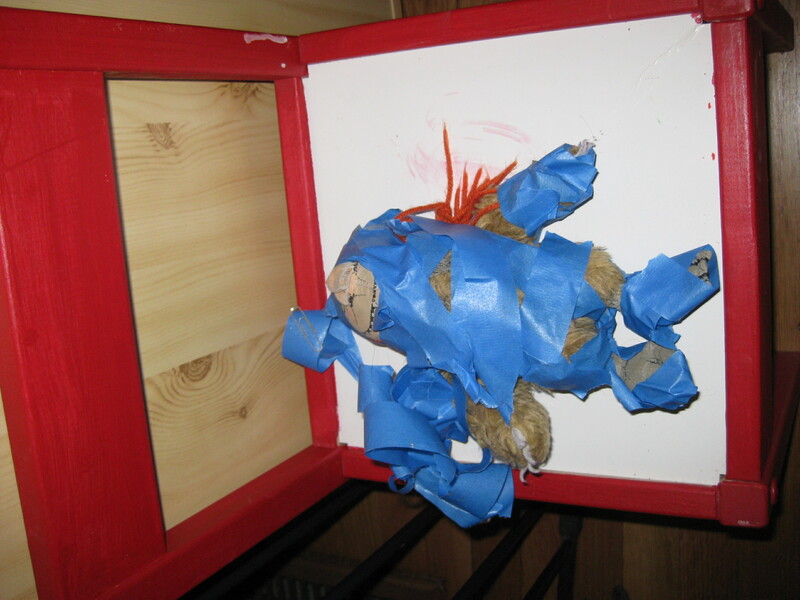 It quickly grew… blue tape, LP and I, we can do anything together. Need a spoon? I can make you one. 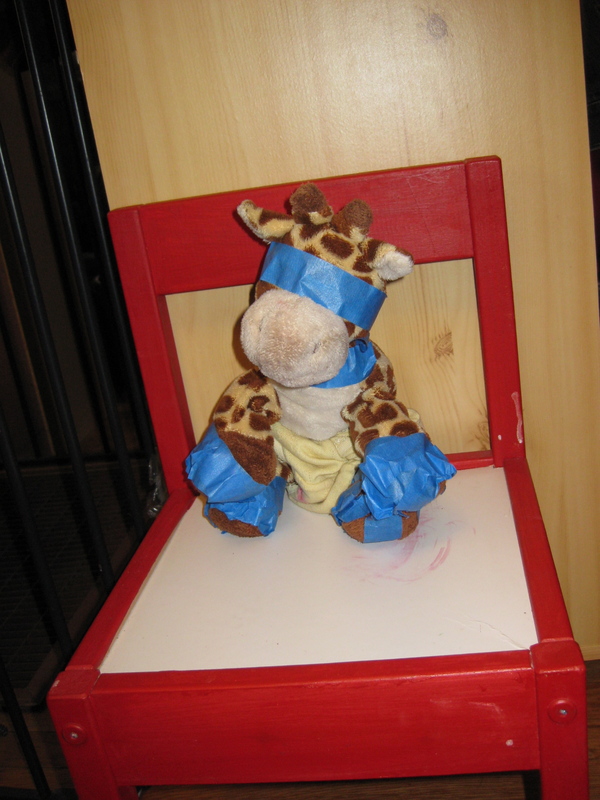 Need in indoor swing for a stuffed animal? We can do that. Puppets to entertain on the plane? Check. Tape pictures on the floor or wall? No problem. The blue tape creations are getting more wild and wonderful as LP takes more and more control of them. She’s just starting to get the hang of ripping off pieces on her own. LP has been on a labeling kick with blue tape. 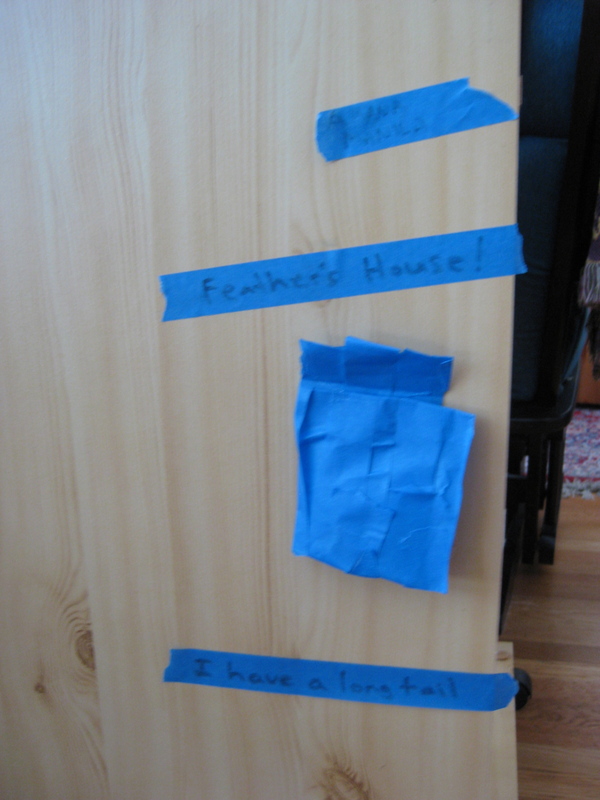 Below is the photo of Feather’s House (Feather being the space heater who lives in our old computer desk when she’s not in use), complete with its own name and a blue tape mailbox. 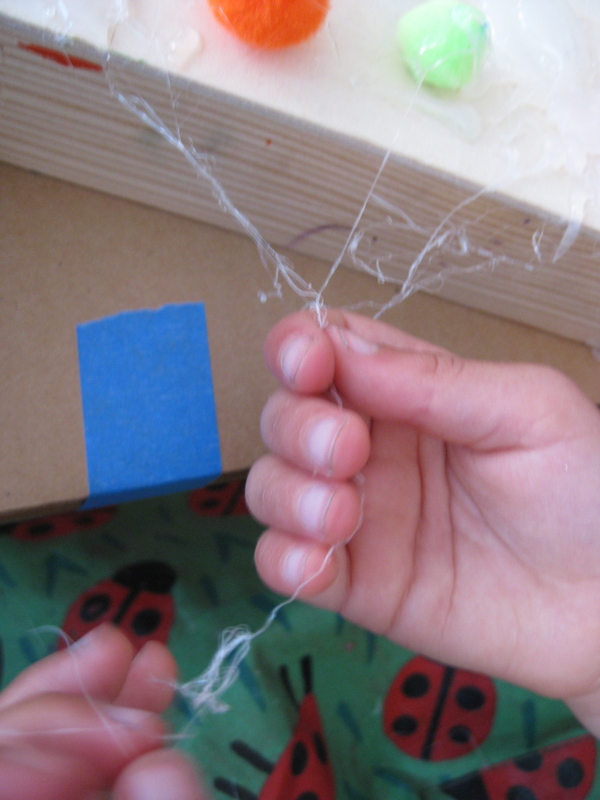 “Spider Web” on Tuesdays with Daddie — this post also has the best description of painters tape ~ “Its like a roll of duct tape married a stack of post-its and they had a blue baby.” So true! Today LP & I were working on a paint project with a purpose. 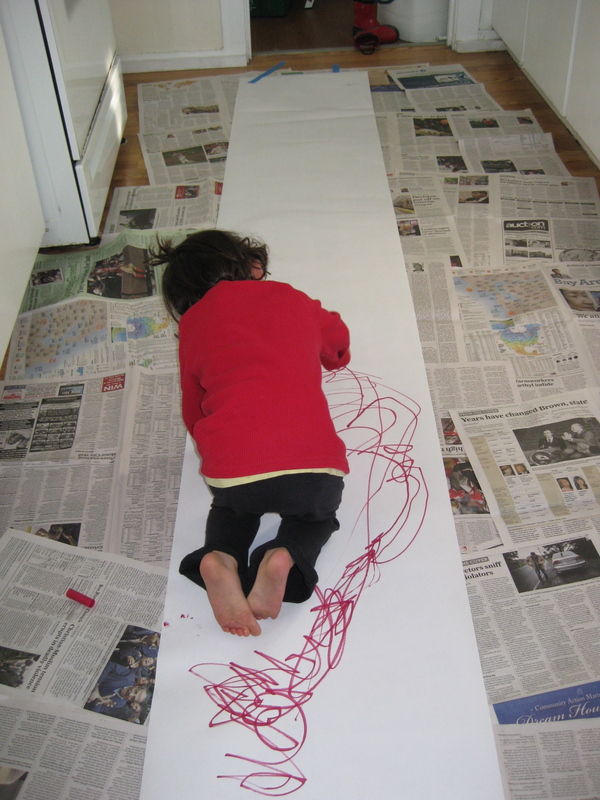 The goal was to create wrapping paper for the three baby gifts that are ready to be mailed. LP started off drawing with a marker while I finished setting up. I found her creation pretty fantastic, especially as she narrated as she drew. 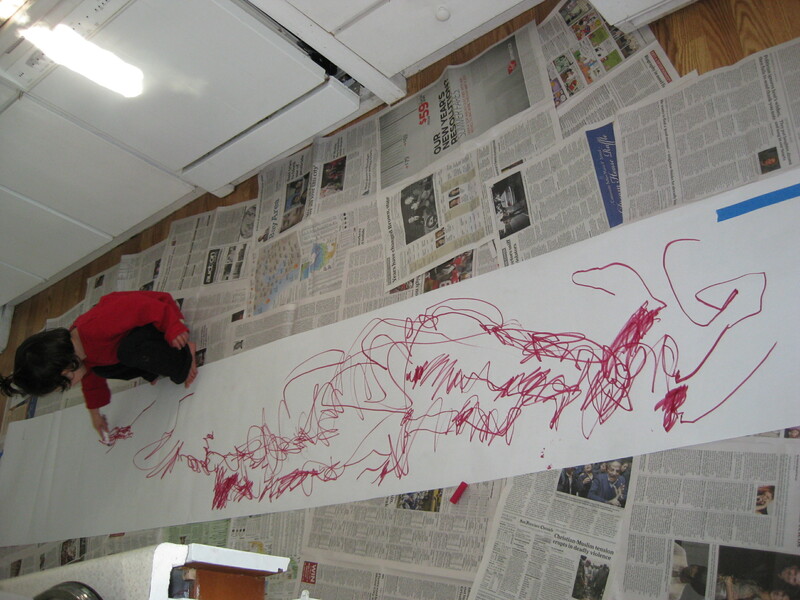 It was so interesting to watch the interplay of the spontaneity of her drawing and of her words. Sometimes she drew something and then talked about it and other times, it was the reverse. The creature is a Mymerona. It has quite detailed anatomy when it comes to pee and poop AND on its other end had separate mouths for each kind of food it likes…so an apple mouth, a date mouth, a banana mouth and so on. 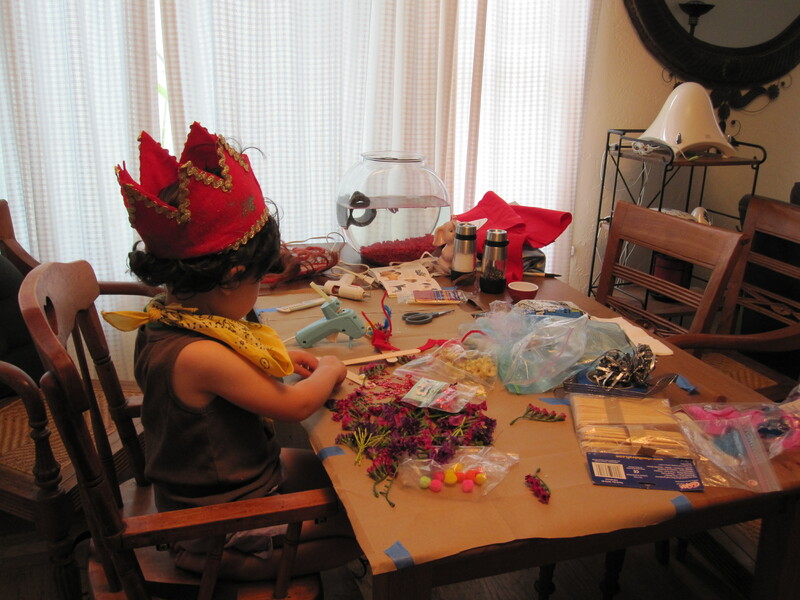 (I love how little people translate their current interests into activities!) This was the first time I’ve seen LP embrace drawing with so much energy and purpose and I thought she might stick with drawing and not ask for paint. I sat on the floor with her while she drew and talked. 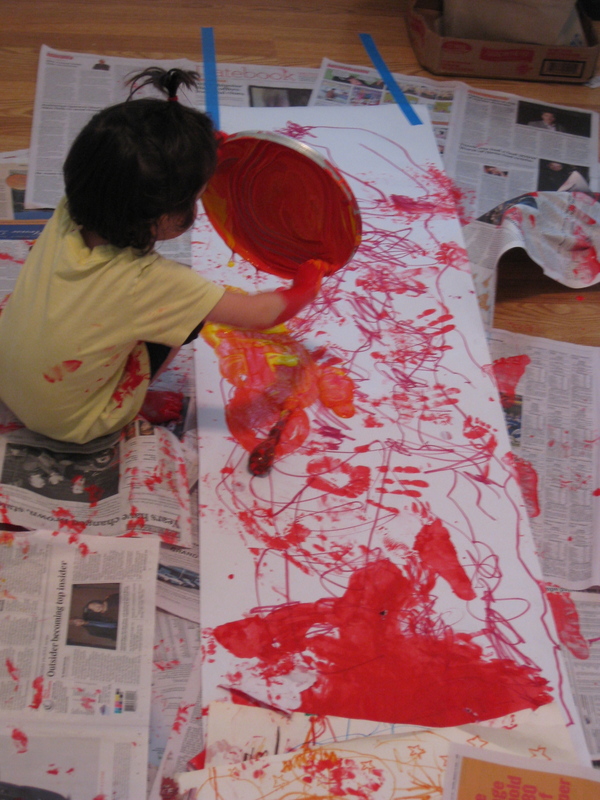 I had suggested that it might be fun to have handprints and footprints on the wrapping paper so she started off by getting her “tools” nice and full of paint. 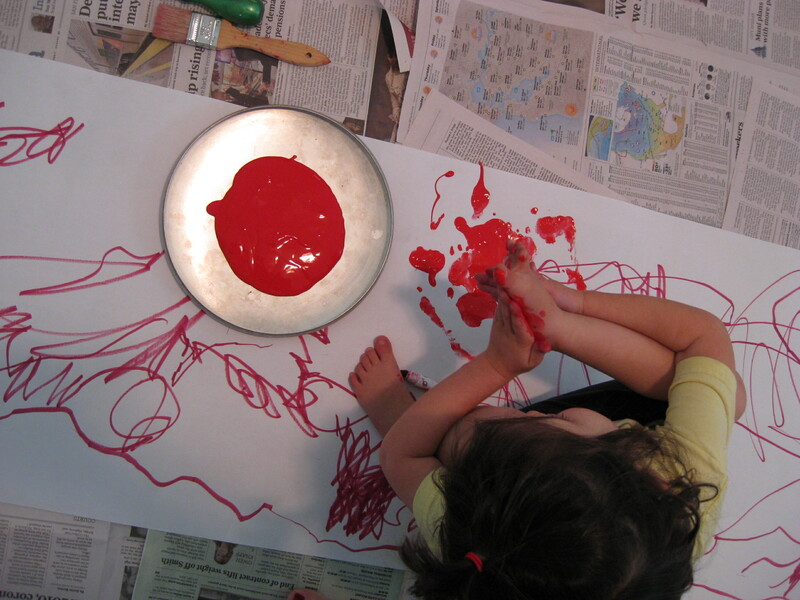 And then she settled into enjoying exploring paint and paper. 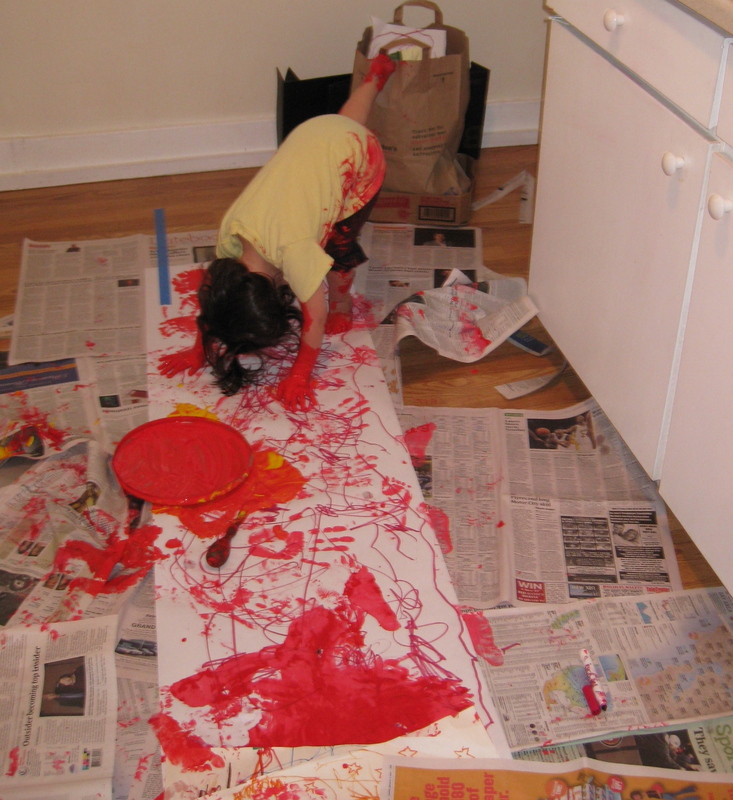 She dumped and poured and swirled and skated (a little bit but was upset when she fell down…paint is pretty slippery). 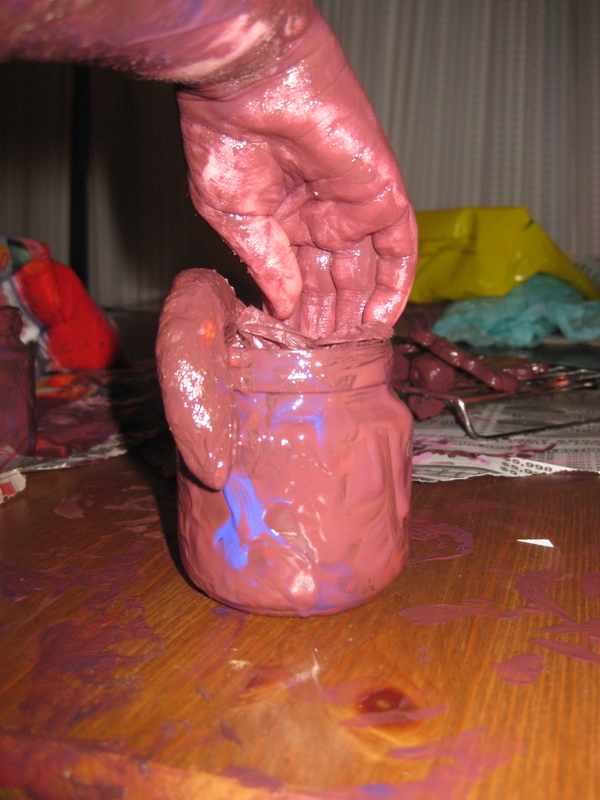 She painted my arms and hands and we did some handprints together and then she returned to her own explorations. And then there was cleaning up. Lots and lots of cleaning up. In the end, about half of the paper is usable wrapping paper which is plenty. Hopefully it will dry overnight and tomorrow morning we can wrap things up together and go to the post office to mail them. This post is part of We Play over at Childhood 101. 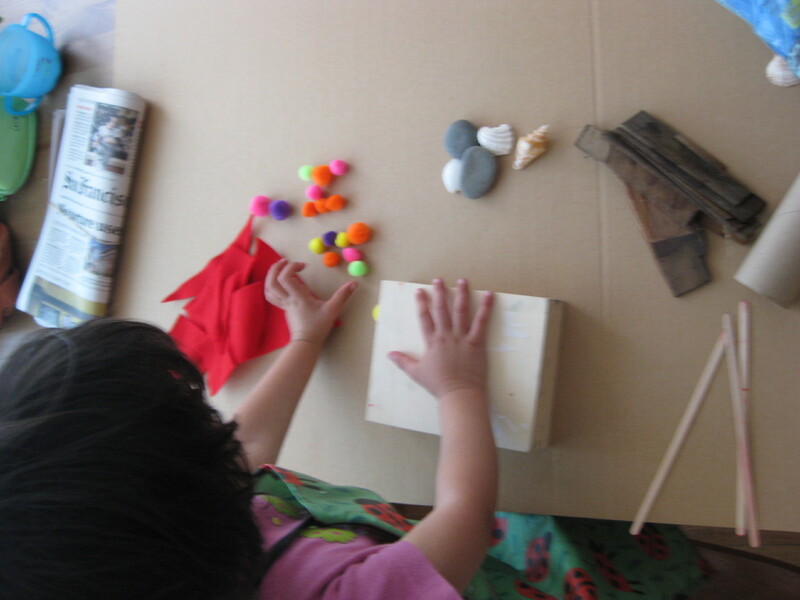 Click on over for lots of great play ideas! We decided to make New Year’s Eve our present-centric holiday including homemade gifts. Somehow even though I knew LP wanted to make ImprovDad a snake for 2 weeks beforehand, I just couldn’t get it together to do the project until the day came. It was a day of many messes. Actually about one mess too many for me to stay positive at the end. Good to remember to start to find closure on projects before I am burned out on the cleaning up. 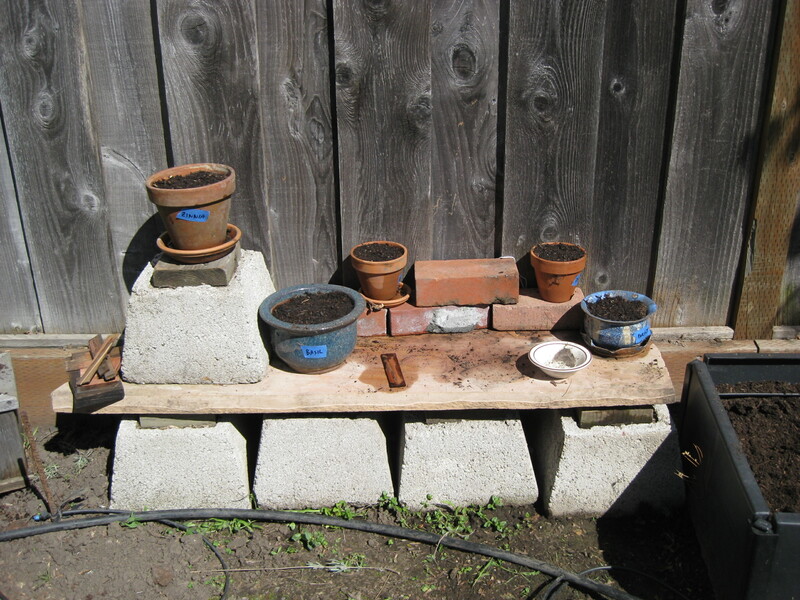 This is one of my challenges for the New Year — finding better balance between the projects and the clean up. I love to let LP make messes to her heart’s content but the positive message I want to give her about exploring and creating sometimes gets undermined by my cranky-pantsness about the resulting clean up. I’ve been working on creating better outdoor space for explorations but in this rainy season, I need to problem solve the indoor play too. AND I want to give her more opportunities to help with the clean up and that means not being at the end of my rope when clean up time happens. 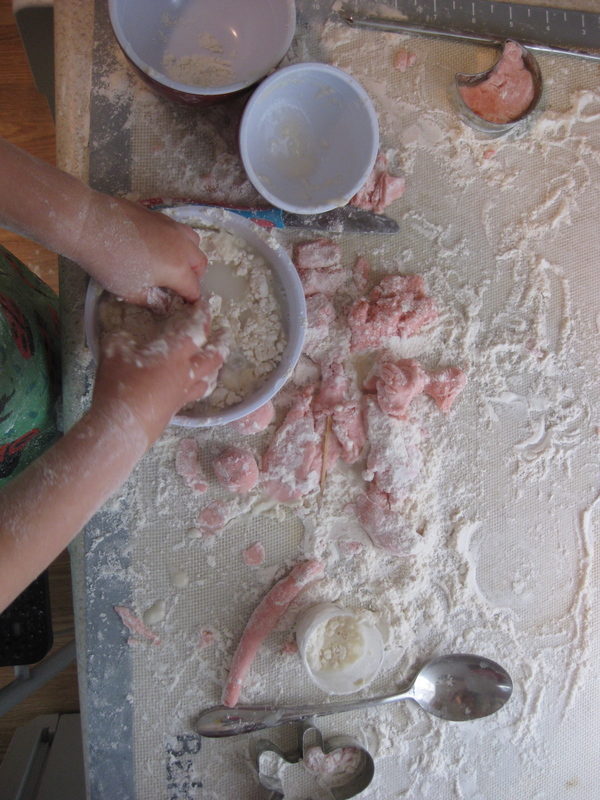 There were lots of spontaneous additions (to both the salt dough play and the paint play) after the goal-oriented part of crafting had been met (actually making a snake). During the paint session, LP transformed the paint jar into a snake home complete with many “snake snacks” (balls of painted newspaper). On New Year’s Eve, the snake was still wet so ImprovDad just got a look. This morning however, LP presented the present to ImprovDad with sweet seriousness…a pleasure to witness. This craft project has been in the works for a long time. I was inspired by Future Craft Collective’s Prayer, Wish, Hope Flags. 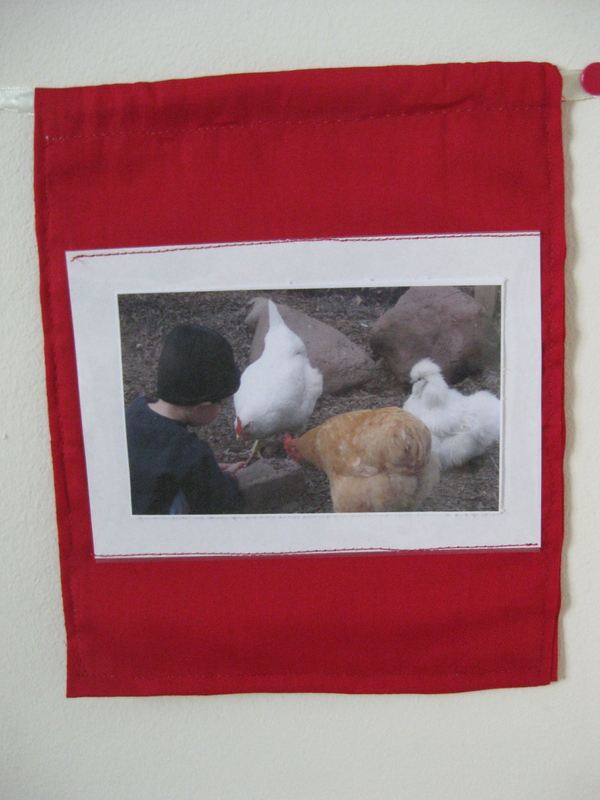 I even sewed up a bunch of muslin flags a few months ago. Where those flags have gone, I do not know. 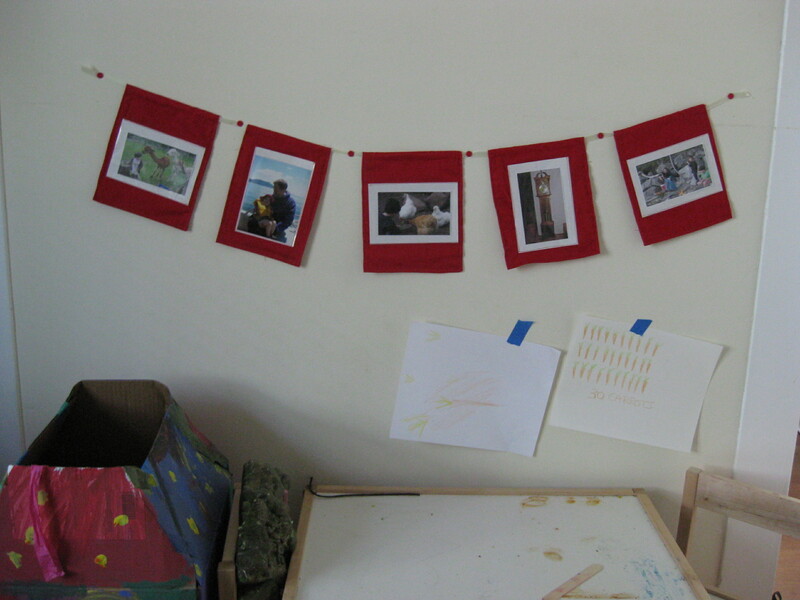 So starting over, I decided to use the basic idea of the flags to create a photo banner that could brighten up LP’s room (with her favorite color as the base). At first I was going to make iron on photo transfers but then I remembered I had leftover photo sleeves which also have the added bonus of letting us swap the photos. I sewed the flags while LP played with pins and thread. Then discovered that while my old scrapbook photoholders were a good idea, they didn’t actually stick to the fabric. So I sewed them to the flags. Voila! LP chose the photos and I printed them out on our ink jet printer. I’m looking forward to seeing how the photo rotation goes. I think it will be a fun way to prepare for visiting family and friends and remembering special occasions.